This is a beautiful and sparkling garden quartz from Brazil ... 1 lb 1.9 oz and 6.6" by 3.5" by 1.4". She is a DT with a keyed contact area along one side. She is most uncommon in that she is very clear, although from first impressions, she appears not so. Her inner landscape is a shades of green chlorite with accents of deep maroon, buff and mauve (often called "lodelite") and a loupe will help you see them and the manifestors inside, covered with the lodelite. 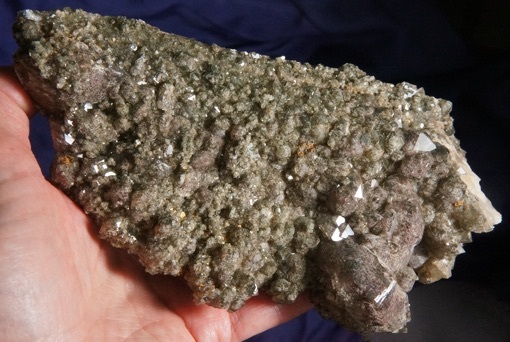 She is a mass of a few large and many tiny to small crystals, all perfectly formed and lightly glyphed elestial terminations ... and a single trigonic record keeper! She is undulating and a gorgeous crystalline garden that will delight you with her beauty and message! She would be perfect for a garden meditation or grid area! This Spirit is wonderful for helping her Keeper relate to the Earth, achieving that balance between Spiritual and earthy so as to remind us all that we are to bring our Spiritual advancement into this physical expression. She helps us understand the beauty and peace in a garden and puts us in touch with the incredible energy of all that the Earth holds. And look at her garden within! Do you see crystalline flowers, rolling hills and devic faces peering out at you? These are protector Spirits, revealing themselves to you. And she reminds us that there is a protective aspect to the earth that we often take for granted. If we allow ourselves to tap into that protection, we can effectively establish a shield that manifests on the Spiritual plane as well. And, every time we do this, we not only protect our Self, but protect the earth as well! She is a Master Crystal beyond any shadow of a doubt!